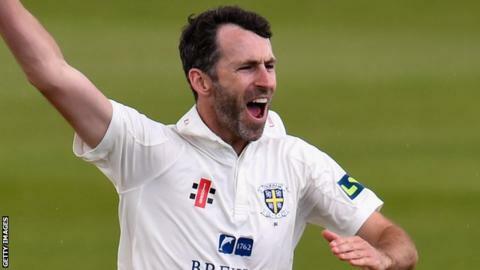 Middlesex took a 145-run lead as 19 wickets fell on a dramatic second day against Durham at Chester-le-Street. The visitors, who resumed on 141-5, were bowled out for just 196, despite Toby Roland-Jones adding 27. But Durham suffered an even worse first innings with Gordon Muchall's 64 the only highlight as they finished on 169. Despite losing opener Sam Robson for a duck, Dawid Malan (56 not out) formed a useful partnership with Neil Dexter (46 not out) as Middlesex closed on 118-4. After a rain-interrupted first day, Dexter failed to add to his overnight 23, being removed by Graham Onions. Onions finished the innings with 7-68 with the wicket of Roland-Jones as Middlesex's lower order failed to take them past the 200-run mark. But the home side failed to capitalise on Middlesex's weak innings, with the hosts slipping to 85-7 in just over 20 overs. Only Muchall saved the hosts from embarrassing themselves further, before Malan and Dexter turned Middlesex's second innings around with their 89-run stand.